1. The income of the parties. 3. Health and age of the parties. 4. Who will have custody of the minor children? 5. Who will receive occupancy of the marital residence? 6. Is the marital property a liquid assets or an asset that is non-liquid? 7. The future ability of the parties to be self-supporting? 8. The tax consequences of the distribution of the assets. 9. Other factors the court may feel are relevant to the equitable distribution of property. 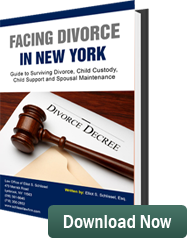 Divorce in New York is not an easy process. Find a qualified, experienced, aggressive and compassionate divorce lawyer and let he or she guide you through the legal maze of obtaining a divorce in New York.